When buying suspension, it’s important to keep in mind what you want to achieve. Are you looking to increase the height of your four-wheel drive? Improve your vehicle’s off-road performance? Or upgrade to a heavier spring rate for additional weight or accessories? A Tough Dog 4WD lift kit comprises of all the necessary components required to give you the full suspension system. Here at Wilkinson Suspension, we stock a wide range of lift kits consisting of a multiple Tough Dog parts. 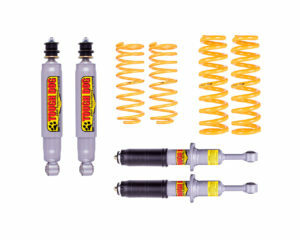 Shock absorbers are a key ingredient when it comes to controlling that all important ride. Tough Dog offer a wide range of shocks to suit your needs including Nitro Gas, Foam Cell, Adjustable and the Big Bore Ralph’s. 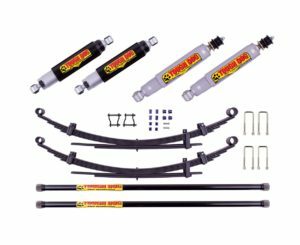 The most commonly used units are designed to suit 2″ Raised suspension however 4″-6″ shocks options are also available to suit some models. Find out more about Tough Dog Shocks. Tough Dog offer raised Coil and Leaf Springs to suit almost every application! When selecting the appropriate spring rate you must take into consideration the additional weight and accessories you may have added to ensure the vehicle is correctly setup. In most cases Tough Dog offer options for 0-300kg Light Load, 300kg Constant Load and 500kg Constant Load on the rear. As well as options to suit different accessories on the front such as a Bar or Winch. 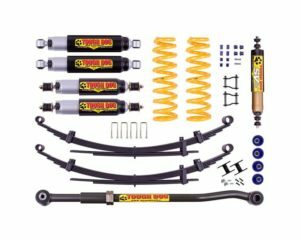 Most options are design to give the vehicle an approximate 2″ Lift with taller springs options available for some models. Find out more about Tough Dog Springs. Suspension bushes are a vital part of any vehicles suspension system. Their benefits include correcting or maintaining steering geometry, better handling and enhanced performance. We carefully select bushes from a variety of well-known brands, allowing your suspension lift kit to perform under pressure. Whether it’s Greasable Shackles and U-bolts for a leaf spring vehicle or upgraded torsion bars for a vehicle with independent front suspension, we have them all. These components are sourced from a variety of top quality brands in order to achieve maximum performance and longevity. We stock a massive range of Tough Dog suspension components for almost every vehicle. If you want to increase your ride height, improve off-road performance or bolster your 4WD for heavy loads, it’s likely our expert staff can help you. Fill out the enquiry form on our Contact Page or give us call on 08 9370 2646!